Save the Date for the Cinco de Mayo Carnival! 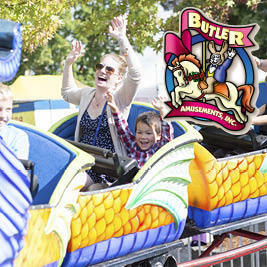 The weekend fiesta includes carnival rides by Butler Amusements, races and a car Show by The Evergreen Speedway, vendor booths by the Monroe Chamber of Commerce and the Evergreen Fair Foundation, food vendors, animal shows, a beer and margarita garden and more! Regular online purchase of Unlimited Ride Wristband are $18. Unlimited Ride Wristbands purchased at the event are $23. Fees apply to online and phone purchases. Unlimited Ride Wristbands are good any one day: May 5, 6 or 7, 2017 at the Evergreen State Fairgrounds. Visit EvergreenFair.org for ride list and restrictions.